One of the ways to be most productive with a project, such as writing book or manual, designing a course, preparing a presentation, or simply creating step-by-step instructions is to start with an outline. Up until recently, OmniOutline was the application I used for outlining projects, but I often found the program a little heavy and cumbersome to use. When I dread opening an application like Word or ScreenFlow it means that I’m find it too task consuming to get certain projects completed. OmniOutline certainly has lots of advanced features, but after I downloaded Outlinely and OutlineEdit, I realized that these two lightweight applications are better suited to my needs for working on projects. What I like most about Outlinely is that I can keep and share all my outlines inside the application instead of saving them as separate documents. Secondly, Outlinely feels more like a simple text editor rather than a bloated application that requires to many configurations to quickly use. In the video below I provide a quick demo of using Outlinely. The video is slightly sped up for quicker viewing, but notice in the highlighted parts of my typing that I use Keyboard Maestro string triggers to trigger the Indent and Outdent shortcuts for Outlinely. This means I can type and not have to take my hands off the main keys to make indents or outdents. As you may have noticed in the video, you can move your cursor to the far right of line of text and use the move button (three lines) to rearrange headings and subheadings. Outlinely also includes other handy features such as Focus and Typewriter modes. Focus mode highlights the current text you’re typing and slightly darkens the existing text, and Typewriter mode simply keeps the text you’re typing in the center of the document so that you don’t have to keep scrolling up when you reach the end of the user interface. As you might expect, Outlinely allows for adding check boxes, formatting texts, adding notes, searching all documents, viewing word count, and changing the font, font size, and user interface theme. And like any good text editor, Outlinely includes the ability export outlines to OPML, PDF, HTML, RTF, and Markdown conversion. 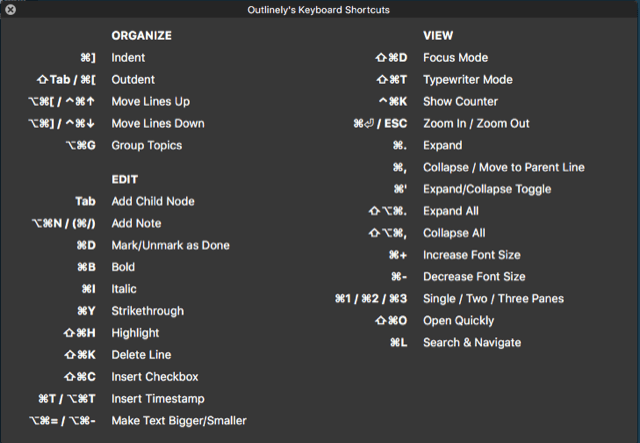 Nearly every feature of Outlinely is assigned shortcuts (see Help>Keyboard Shortcuts), which means for us Mac automators, we can trigger these shortcuts using BetterTouchTool finger gestures and Keyboard Maestro string triggers. As you see in the video, in addition to the Keyboard Maestro string triggers I explained above, I’ve also set up BetterTouchTool gestures for manually adding check boxes as well as indenting and outdenting lines of text. Check boxes are automatically inserted to a series when you hit the Return key. As I work in Outlinely more, I probably will set finger gestures and string triggers for deleting lines, quickly adding a child node, moving lines up and down. And as with other advanced text editors, you can use the macOS voice-to-text dictation feature, which is easier for dictating lines of text rather than whole paragraphs. I however use Dragon Dictate for text dictation. I can also set up voice commands to trigger Outlinely keyboard shortcuts. 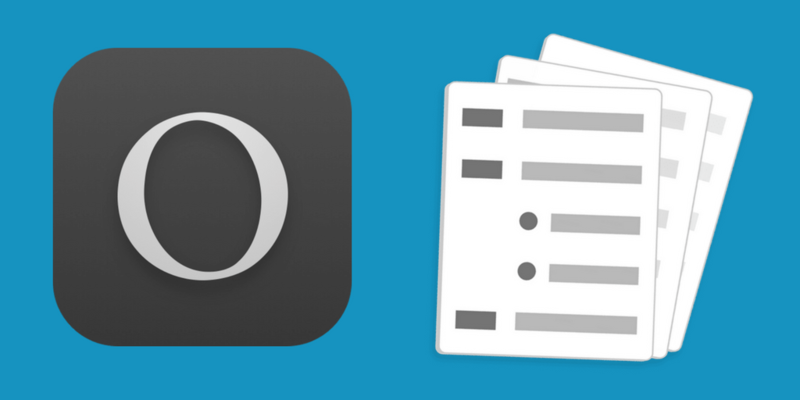 Outlinely is also a cross-platform Mac and iOS application. The Mac version has a free 5-Day Trial download. What may be a drawback for some users is that the pro version of Outlinely is $19.99 per year. 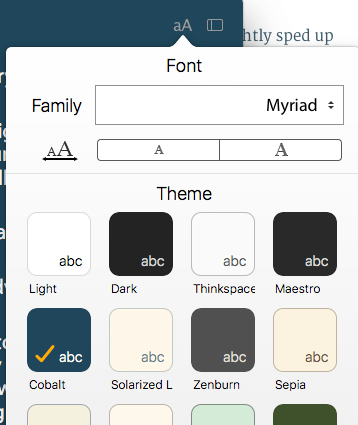 The pro version includes the ability to sync content between all your devices, export to OPML and Markdown, full library search, full-screen mode, the ability to customize the keyboard’s accessory buttons, and the drag and drop features. If you’re attracted to attractive well designed user interfaces, Outlinely has you covered in that area as well. The application comes installed with over a dozen themes, and additional themes can be downloaded from the Glam Development website. The iOS versions of Outlinely are free, and the user interface matches well the Mac version, so you don’t feel lost when switching between each platform. The folder structure of Outlinely also makes it easy to access your favorite and most recent outlines, as well as saved and managed outlines in folders. It’s so much better, in my view, to have all the outlines in a single library rather than as separate documents. You can hide the sidebar for less distraction, and open outlines in a separate window. However, as of this writing, I wasn’t able to able to get an outline to open in a separate window. You can download 5-day trial of Outlinely for Mac. The full license version is $39.99, and the iOS versions are Free. The Pro version is $19.09 per year. In many ways OutlineEdit is similar to Outliney in its modern light weight user interface and supporting features including line indent and outdent, text formatting, check boxes, outline sharing, and the ability to rearrange lines of text. If you’re writing a long outline, you can create color-coded categories for say each section of the outline or for a selected line text. Tabs for each category appear at the bottom-right side of the document for quick navigation. Similar to Outliney, OutlineEdit allows you to attach a note to individual outlines, and to keep track of available document stats, including the number of items in outline, the number of words, excluding title and notes, character count, checked items, and even the amount of time the document has been opened. These bits of information also appear at the bottom of the document. If you’re a student, researcher, or anyone who needs to highlight and outline text as you read it in Safari, OutlineEdit does something quite magical. You can download the Safari extension for OutlineEdit. When you run it in the browser you can highlight text in yellow. But then OutlineEdit goes a step further. 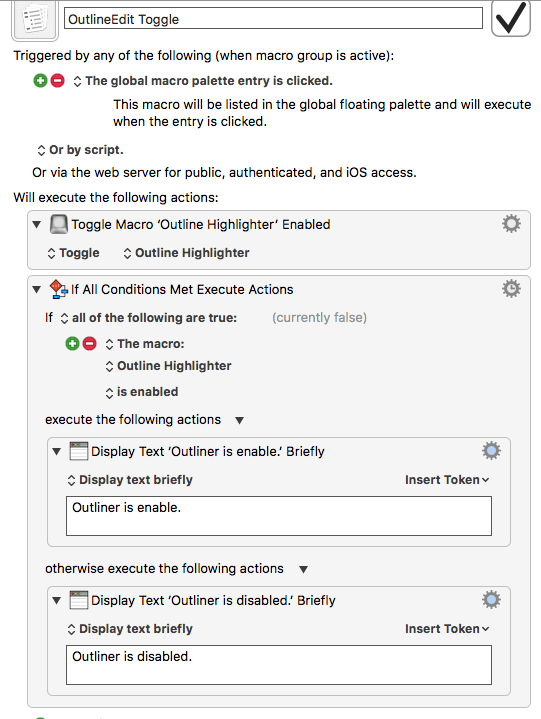 The Safari extension includes a feature for converting your highlights into an outline in OutlineEdit. This highlight feature sets OutlineEdit apart from other outline applications. I probably won’t be using the highlight feature a lot, but I went ahead and created a Keyboard Maestro macro that triggers the OutlineEdit Safari extension hotkey that highlights the selected text. 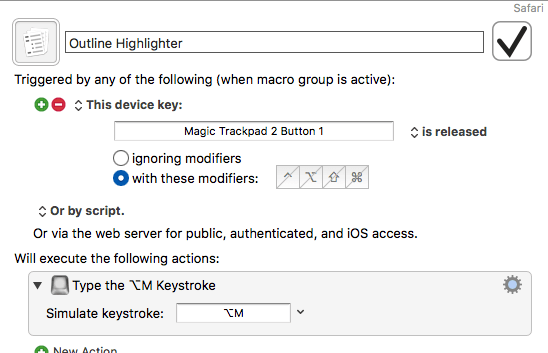 The macro I use includes a USB Device Key Trigger, which means that after I press on the trackpad and select the text in a Safari page, and then RELEASE the click, KM triggers the hotkey for OutlineEdit mark button. However, I can’t leave this macro enabled indefinitely because it would fire each time I click and release on the trackpad. So I created another macro to enable and disable the macro. I assigned the latter macro to the Global Macros palette for quick access. Both Outliney and OutlineEdit have very useful and unique features. Because OutlineEdit is free, there’s no reason not download it, especially for its highlighting feature. Outlinely on the other hand is probably more useful if you plan to do a lot of outlining, and you want to share them across your iOS and Mac OS platforms. I look forward to using applications on a regular basis. Let me know if you decide to try them out and what you think of them. Might be worth checking out http://www.workflowy.com too. Fewer features but sometimes that’s awesome. Aman, thanks for the feedback. Hope you keep me/us posted about Mac automation is going for you.